Helping to reunite lost pets with their owners is how we got started! We have a huge Facebook network that helps search for pets that strayed too far from their home. We have successfully reunited countless pets with their families! If you are looking for your lost pet or just want to become part of the network to help others, please visit our Help Find Sophie Facebook page! 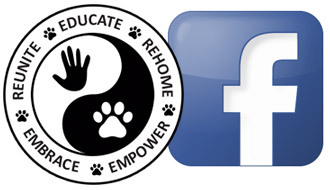 Our Facebook network is what helps us reunite pets and owners! Below are links to gallery pages where you can help with finding lost pets or where you can have photos posted of your lost pet. Our Facebook network is what helps find new homes for pets! Below are links to gallery pages where you can help with finding new homes for pets or where you can have photos posted of your pet that needs a new home.